In just a week and a half, Apple will expand its retail operations to its 12th country when a new storefront opens in the Netherlands. The grand opening of the new Apple Store in the Netherlands will take place next Saturday, March 3 at 10 a.m.. That will make it dozenth country where Apple operates its retail business, according to Gary Allen of ifoAppleStore.com. The Amsterdam location will be on the ground floor and mezzanine of the city's historic Hirsch Building in Leidseplein Square. The two levels will be connected by a glass spiral staircase, which is a defining feature of many of Apple's retail locations. "The interior of the store is reminiscent of the Opera (Paris) store, according to spy photos, with a tall ceiling, ornate support pillars and many other renovated details," Allen wrote. "Administrative offices will occupy an upper floor of the building." The first indication of the Netherlands store came over a year ago, and last month spectators got a look at the construction underway after a tarp concealing it was blown away. Earlier reports pointing toward a mid-February grand opening were inaccurate. Apple began hyping that the store was opening "soon" earlier this month, but did not give a specific date. 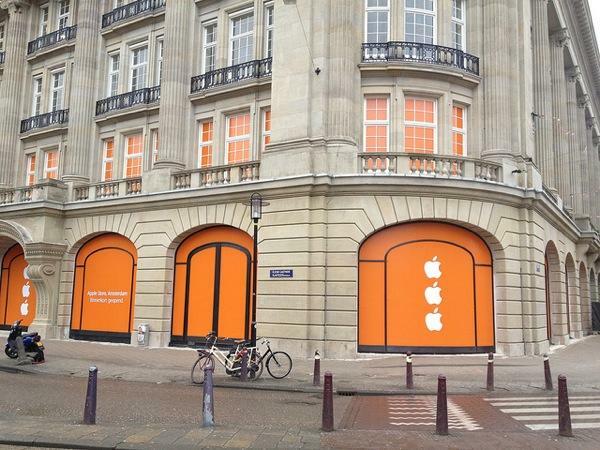 The windows on the storefront have been blocked out with advertisements showing the white Apple logo against a background of the Netherlands' official color of orange. The Netherlands store will join the company's Benelux headquarters, which is located two floors above it in the Hirsch Building. In addition to a tall ceiling, the interior will feature "ornate support pillars and many other renovated historic details," Allen said.